Eggplant is by far one of my favorite vegetables. Until recently, I preferred the Asian kinds, Italian white kind and Indian kinds, but not so much the chunky American type – you know which ones I am talking about, right? The huge blackish purple giants that you see commonly at supermarkets. One of the main reasons is because I simply didn’t like their texture. To me, they had too much water in them. And their skin was too tough and they tasted rubbery most of the time! That is until recently, when I figured out how to make them less chewy, more delicate and better tasting! This recipe utilizes few of the tips I incorporate whenever I work with this particular type of eggplant. Peeling the eggplant first and slicing them thin lengthwise helps in making them softer and more flavorful during the cooking process. This recipe seriously is definitely a keeper for wholesome weeknight dinners, provided you have the main ingredients – eggplant and ricotta. 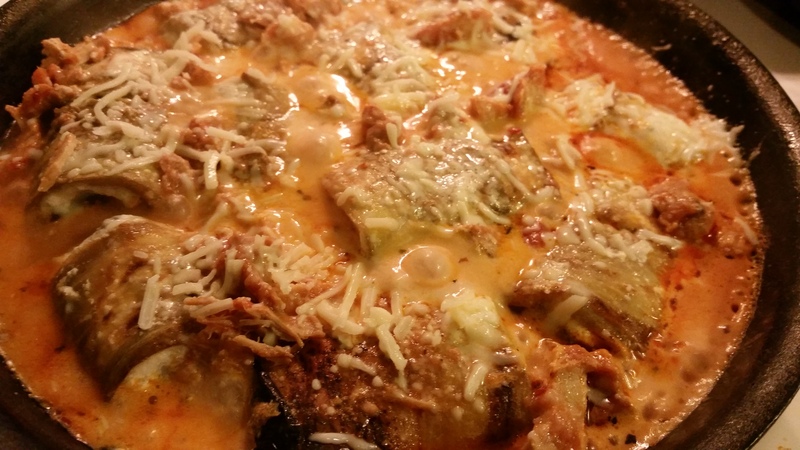 Steps are simple – slice and precook the eggplant, spread cheese mixture on each slice and roll it up, place them in a skillet with a good quality pasta sauce, top with any remaining cheese and grated mozzarella and let simmer. Voila! In less than 10 minutes, you will be able to open the lid and scoop out the cheesy, hearty eggplant-ricotta rollups onto your plate to devour! 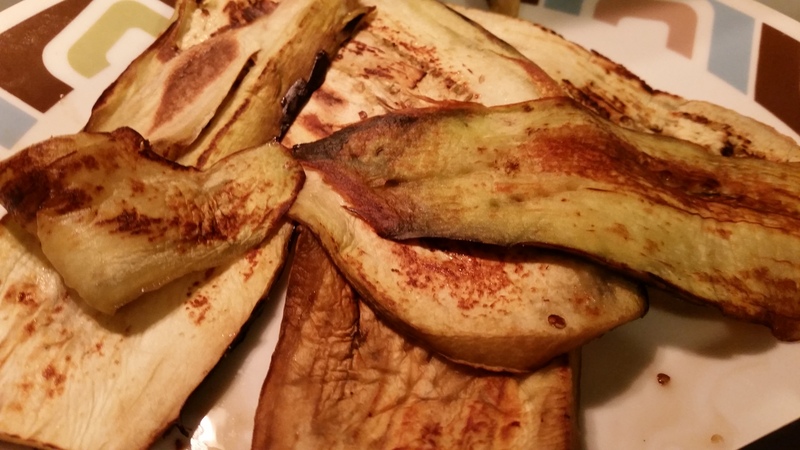 TIME SAVING TIP: You can pre-cook the eggplant slices ahead of time to save precious minutes! 1. Preheat a frying pan over medium high heat and coat with olive oil. 2. Cook eggplant slices in single layer till they are soft and golden. Set aside. 3. 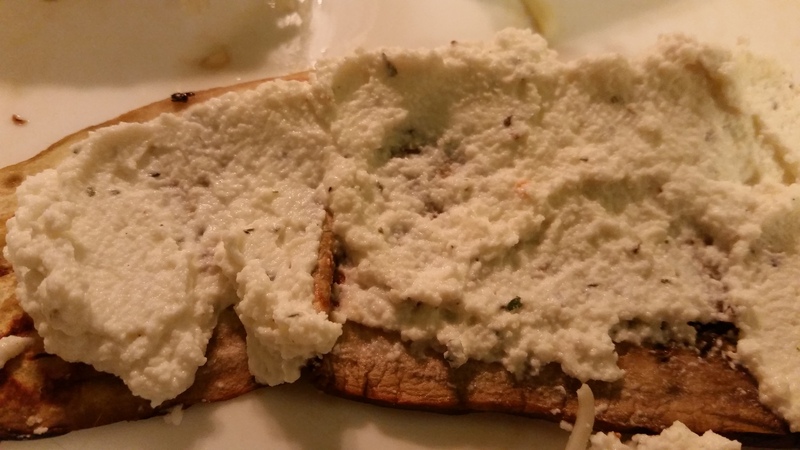 In a small bowl, mix together the ricotta, parmesan, herbs, garlic, salt/pepper and 1/4 cup mozzarella. 4. 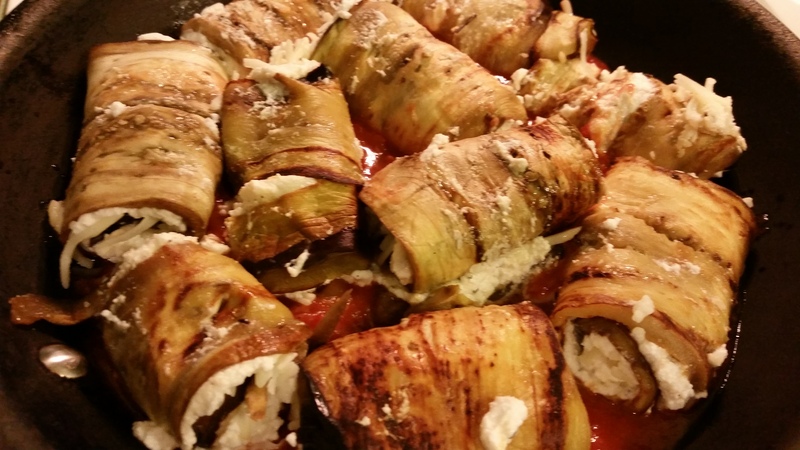 Spread about a heaping tablespoon of cheese mixture on the eggplant slices and roll them up. 5. Heat a skillet over medium high heat and add the pasta sauce. 6. Place the rolled eggplant slices in a single layer and top with any remaining cheese mixture. 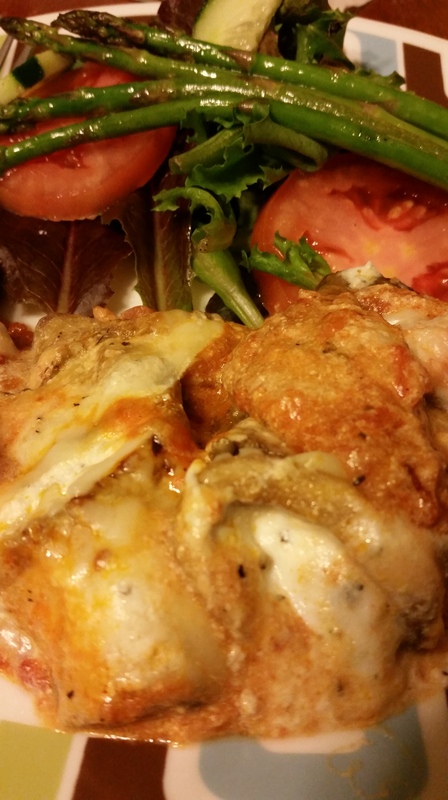 Top mix remaining 1/4 cup mozzarella cheese and cover. 7. Reduce heat to medium and let simmer for about 10 minutes till it gets hot and bubbly. 8. Serve immediately with a side salad or another dish of your choice. Hey guys, I have a question for you…what is the most versatile thing in your pantry? Hmm…so you too think it is pasta! Oh, good, then we are on the same page! What is not to love about it, right? It cooks so fast, could be made into a both cold and hot dishes, tastes great with or without meat and comes in many shapes, sizes and varieties! So, yes, I guess they are one of the best things to have around in the pantry, right! Anyway, I am glad I had one of those boxes in the pantry the other night! 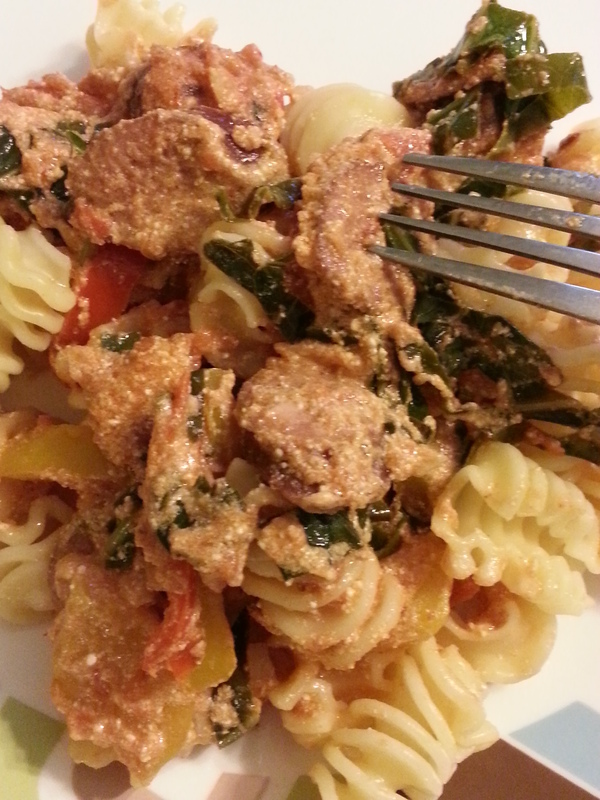 Some cooked pasta tossed with sausage, ricotta, tomato sauce and few other ingredients made for a wonderful dinner after a busy day at work! Adding vegetables into this dish makes for a true one-pot dish that provides a well-balanced meal. Kids will likely eat right through without realizing they are actually eating vegetables! A win, right! Why don’t you try it out and share your comments! 1. 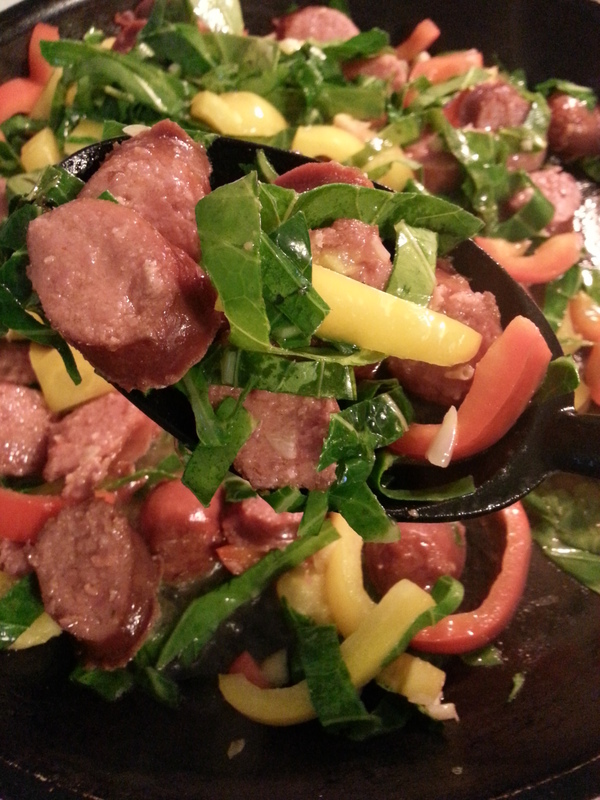 Heat a large non-stick frying pan and lightly brown the sliced sausages. 2. Remove the sausages and keep aside. In the same pan, add the olive oil and cook the onions and garlic for 2 – 3 minutes. 3. Add the veggies and continue cooking for about 5-7 minutes. Add back the sausage. 4. 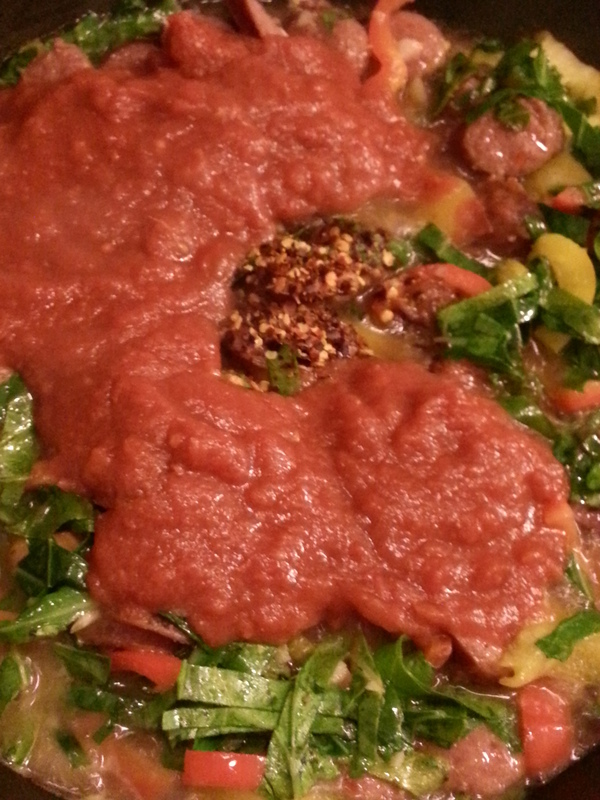 Stir in the tomato sauce, herbs, crushed red peppers, salt and pepper and simmer for 5 minutes. 5. 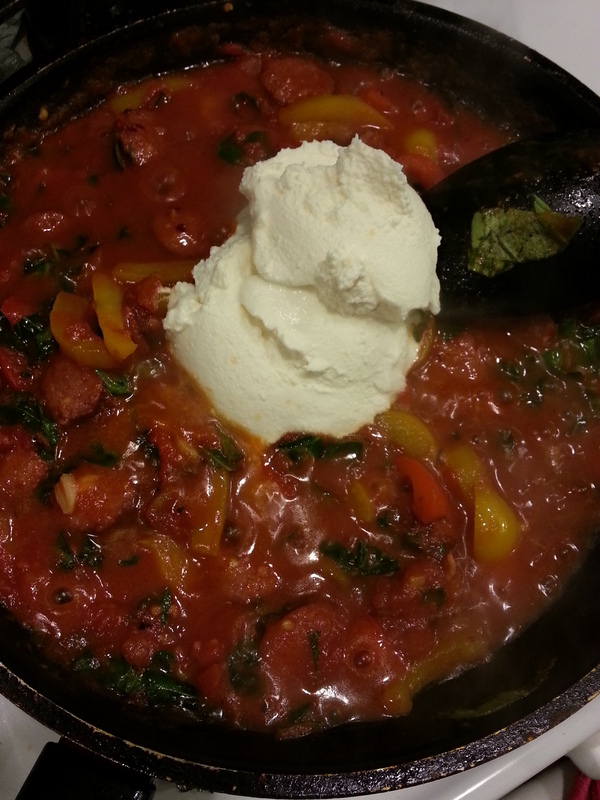 Gently stir in the ricotta cheese. Toss in the pasta. 6. Serve immediately sprinkled with a bit of mozzarella or parmesan! Here is a yummy recipe just in time for your weekend breakfast, although this could be whipped up for a weekday starter as well. Pancakes are simple yet delicious, especially when you mix in various add-ins like nuts, chocolate chips, diced fruits etc. 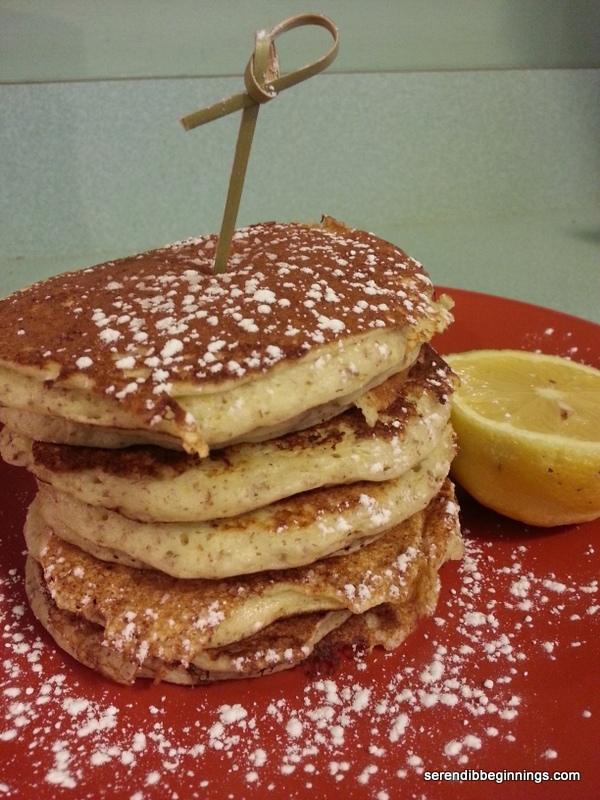 One of my favorite type of pancake is the one using ricotta cheese. Ricotta goes incredibly well with citrus, specifically orange or lemon – either combination is irresistible. 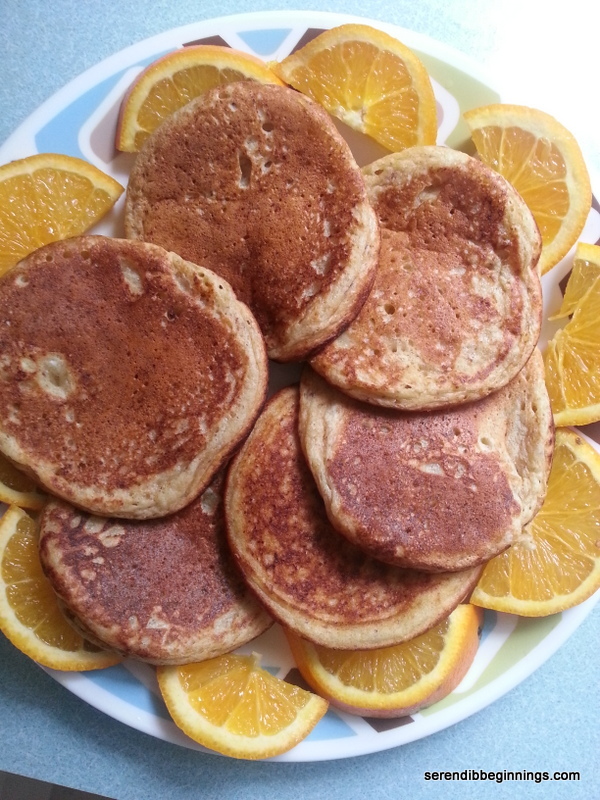 I have made these pancakes with both orange and lemon and I must say each had its own nuances when it came to taste and flavor and I enjoyed both types. This recipe is a spinoff from the original found on Williams-Sonoma website. 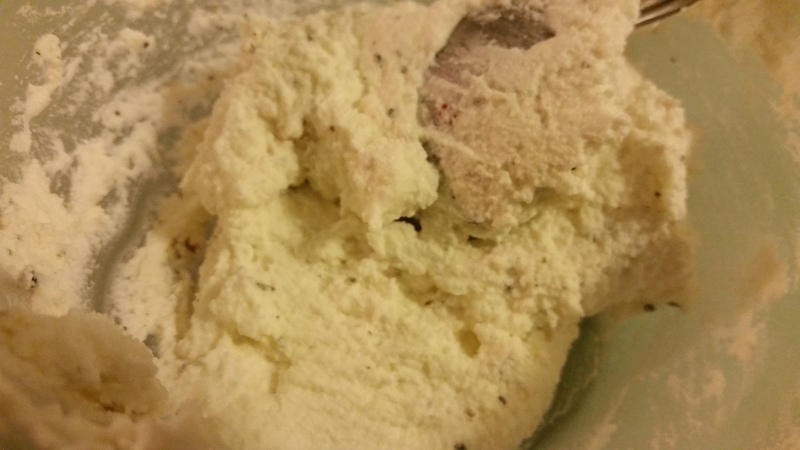 I made couple of changes including using a combination of all-purpose flour plus cornstarch instead of cake flour and replacing some of the flour with ground flax. 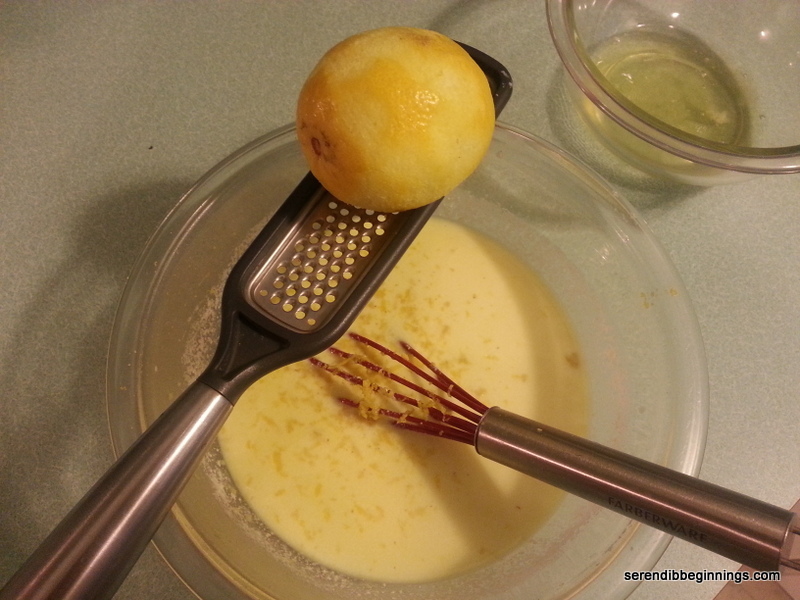 I also used 2 extra large eggs and juice from only 1/2 the lemon – although next time around I will try a whole lemon. Lastly, you can certainly add in some chocolate chips to these pancakes – who can resist the combination of citrus and chocolate?! 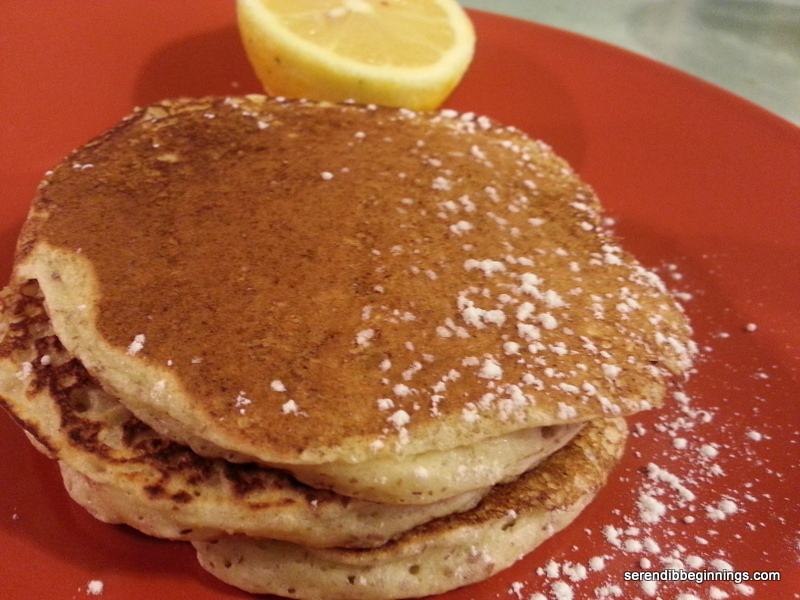 These pancake are already slightly sweet, so they just need a light drizzle of maple syrup or honey – or as suggested in the original recipe, raspberry sauce! Yum! 1. 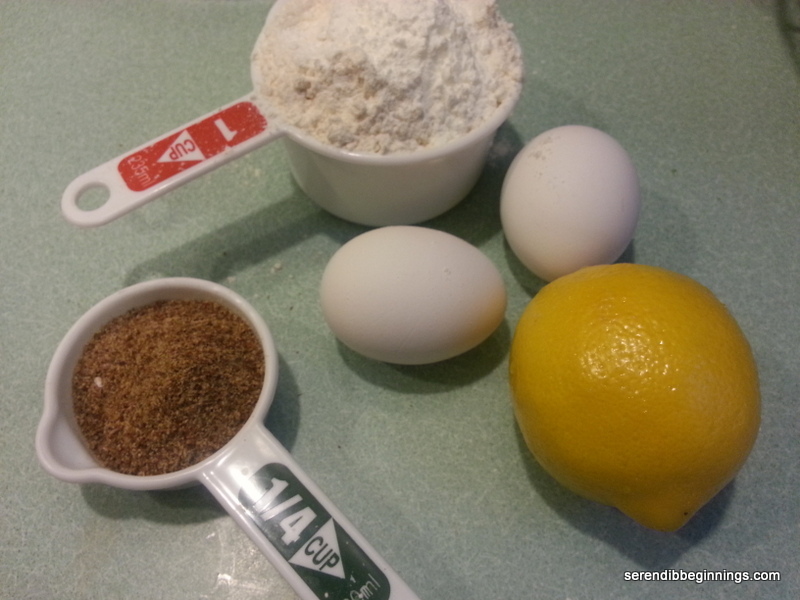 Mix ricotta, milk, egg yolks, sugar, lemon zest and lemon juice in a medium bowl. 2. 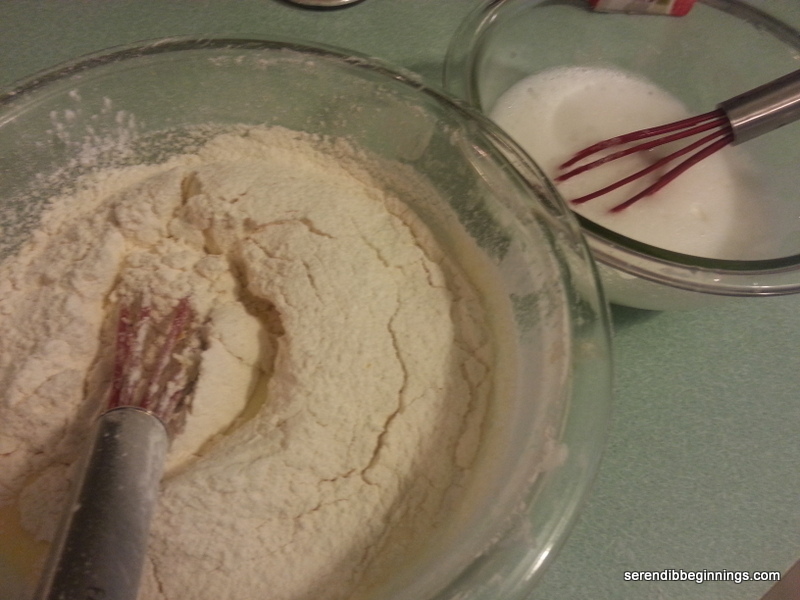 Sift together the flour, cornstarch, ground flax, baking powder and 1/8 tsp salt. 3. Stir in dry ingredients into the wet ingredients just until combined. 4. Whisk egg whites till frothy. Add remaining 1/8 tsp salt (I used kosher) and continue whisking until soft peaks form. 5. 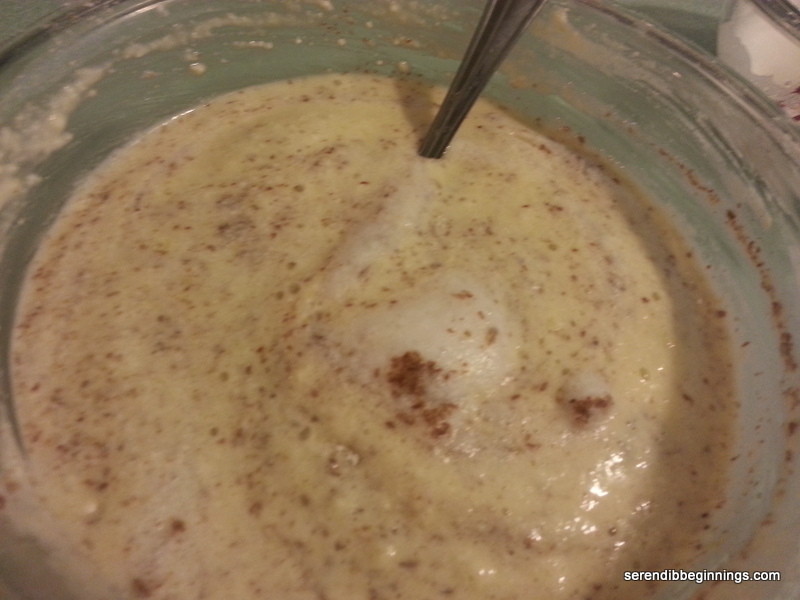 Slowly fold in about 1/2 the egg whites into the pancake batter and follow with the rest. 6. Heat a griddle over medium heat. Lightly grease and prepare the pancakes as usual. 7. Serve immediately with your favorite syrup or raspberry sauce. Happy St. Patrick’s Day everyone! I really had all the intention to develop a complete St. Patrick’s Day dinner menu with a green color theme – including a mint, avocado or pistachio based dessert! But, alas, time just slipped by too fast! In an attempt to at least pull together a wholesome main entrée, I looked around my kitchen for appropriate ingredients. 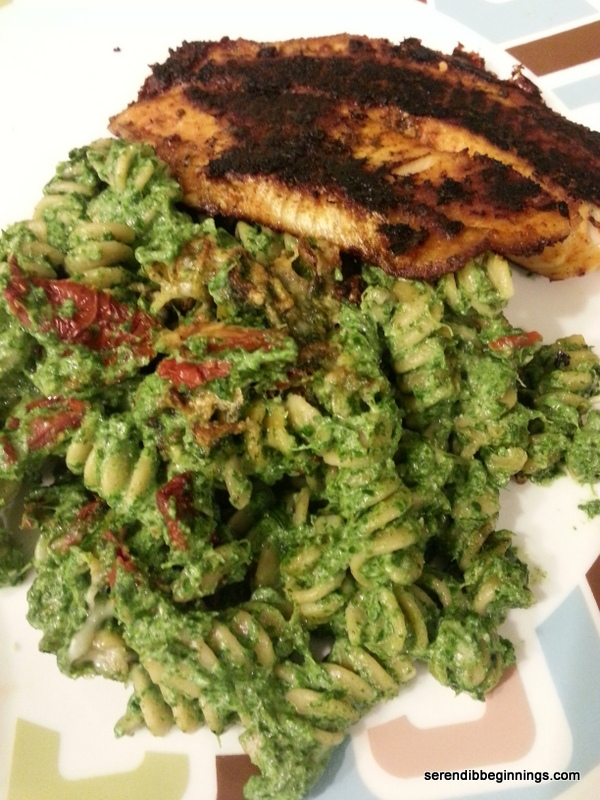 We enjoy pasta, so I decided to take the route of a pasta dish served with a pan grilled tilapia filet. This pasta, as you can see from the picture, is very green! If green is not a favorite food color in your household, I would like to urge you to still give this a try. Spinach combined with garlic and ricotta results in such a delicate flavor, you will soon overlook the color. 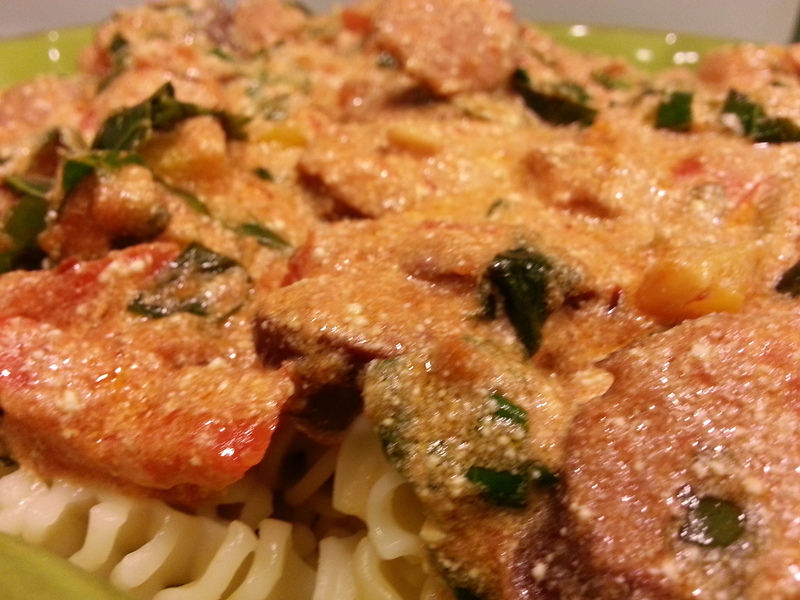 The color did not bother my family even a bit, and I must say, I will certainly prepare this dish again. 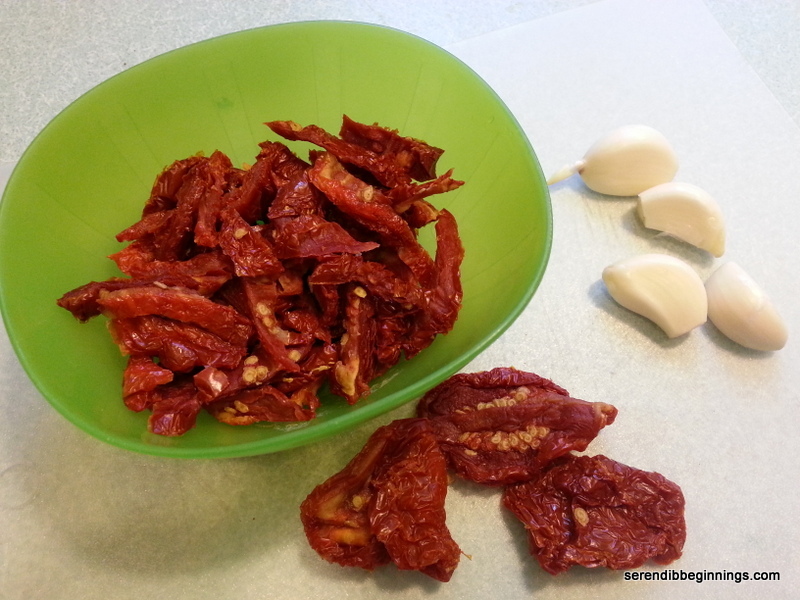 I hope you will give this recipe a try and let me know your feedback. 1. Prepare pasta according to directions. 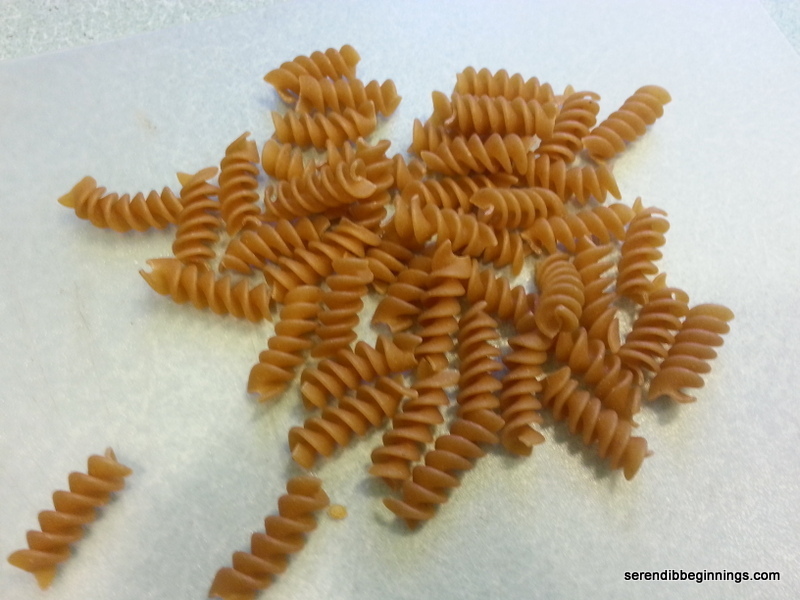 Drain, reserving about 1/4 cup of pasta water. 2. Thaw frozen spinach, squeezing out excess water. 3. Heat a small sauté pan over medium heat. Add a tablespoon of olive oil and lightly brown the garlic. 4. 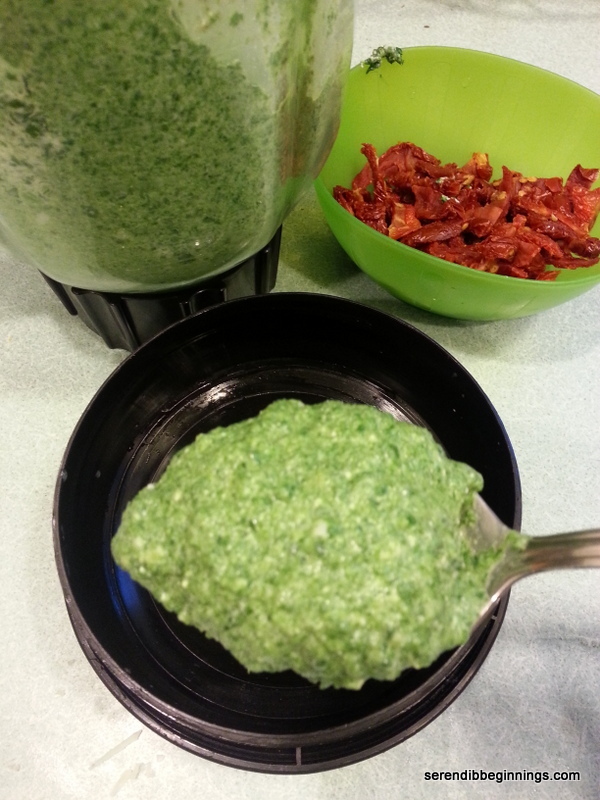 Blend spinach, garlic, ricotta and reserved pasta water in a blender or food processor till smooth. Season with salt and pepper. 5. 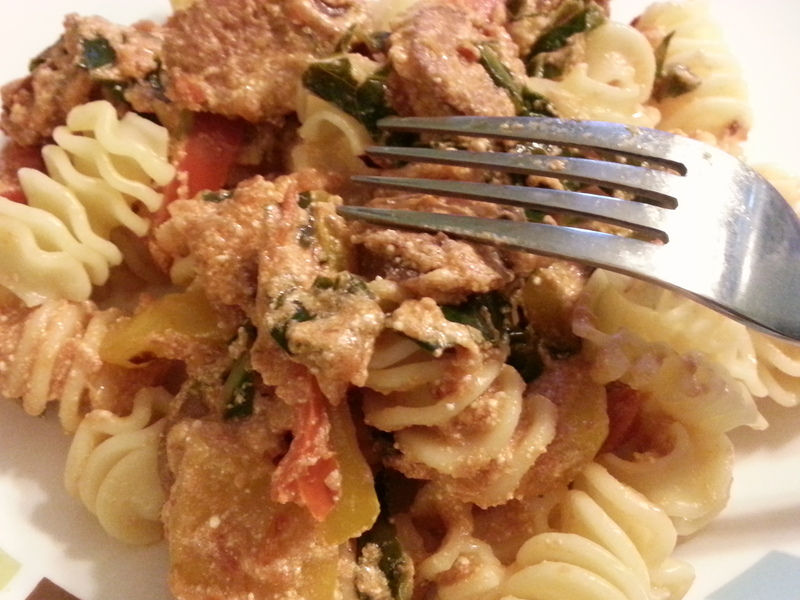 Pour the spinach sauce over cooked pasta. 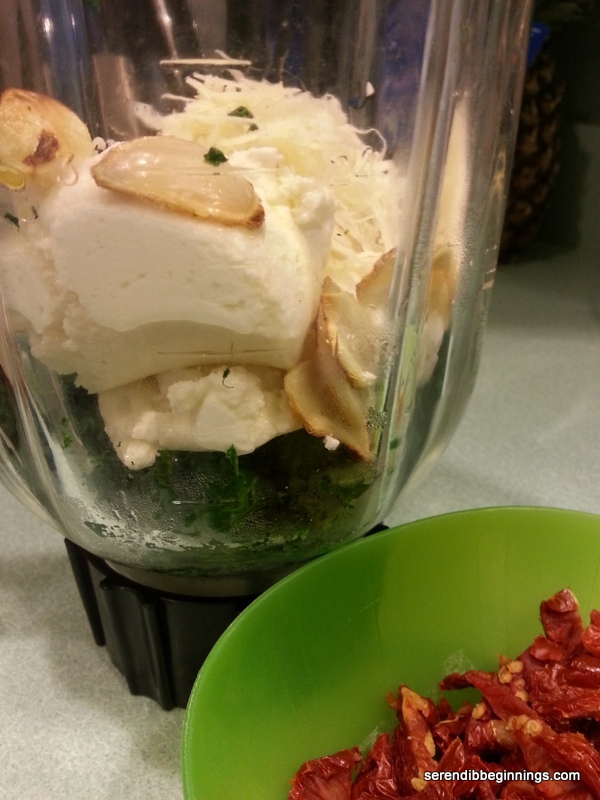 Add white cheddar or mozzarella cheese and sundried tomato and toss to mix. 6. 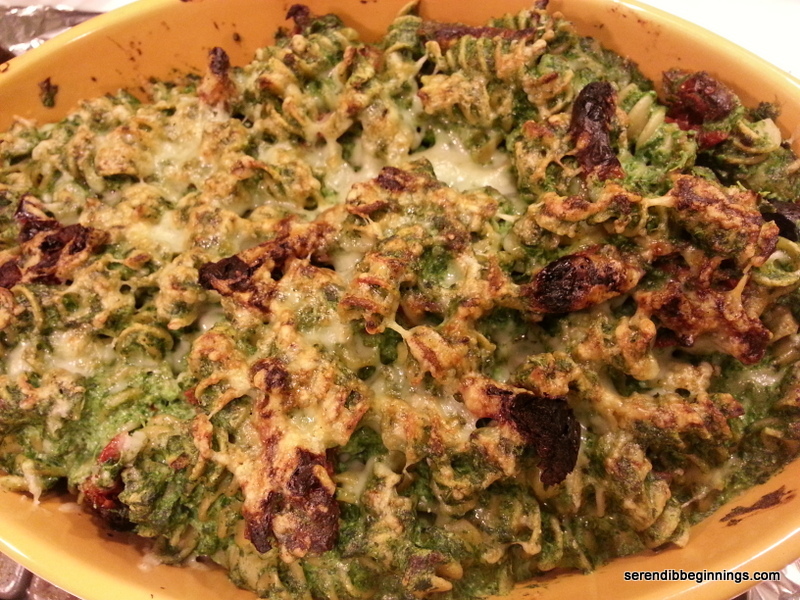 Transfer the pasta/sauce mixture to an oven-proof baking dish and sprinkle parmesan cheese over it. Drizzle about the remaining tablespoon of olive oil. 7. Place the dish under the broiler set at medium high/high heat and broil for about 5-7 minutes till cheese is melted and top is lightly golden. 8. Serve immediately with grilled chicken or fish.